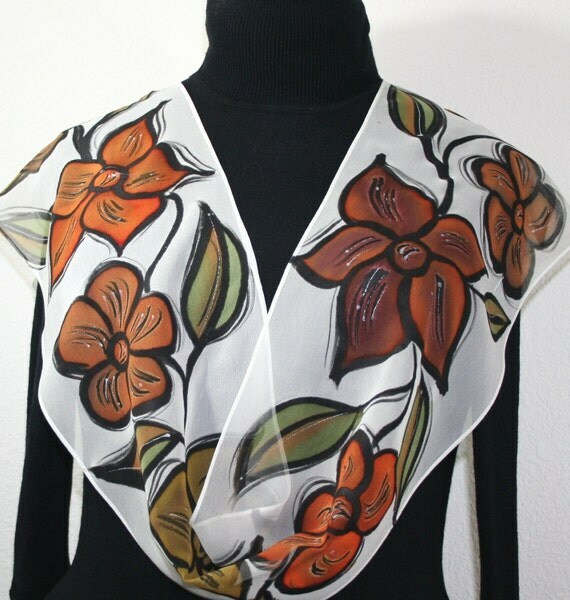 White Green Brown Hand Painted Chiffon Silk Scarf AUTUMN FLOWERS, by Silk Scarves Colorado. Select Your SIZE! Birthday Gift, Anniversary Gift, Christmas Gift. Bridesmaid Gift. Gift-Wrapped. Elegant Handmade Silk Scarf. Hand Dyed Silk. Handmade in Colorado, USA. 100% silk. This is a 100% Chiffon silk scarf, featuring flowers in autumn colors, on a background in white - outlined in black; decorated with very thin metallic accents in silver and white. - Size Small: 8" x 54" (20 cm x 137 cm). 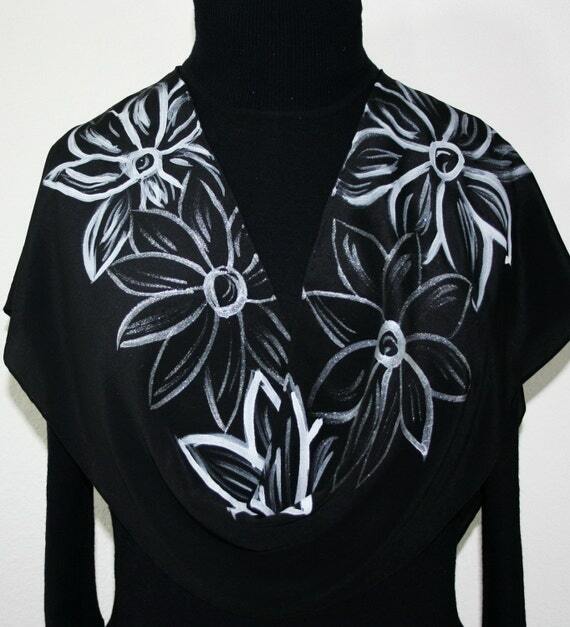 Black White Floral Silk Scarf Hnd Painted SILVER FLOWERS, by Silk Scarves Colorado. Select Your SIZE! Birthday Gift, Anniversary Gift, Christmas Gift. Bridesmaid Gift. Gift-Wrapped. Elegant Handmade Silk Scarf. Hand Dyed Silk. Handmade in Colorado, USA. 100% silk. This is a 100% silk scarf in black, decorated with flowers in white and silver. It is a beautiful, very graphic silk scarf that makes a great statement. Black Silver Silk Scarf Handpainted Hand Dyed Silk Shawl BLACK BEAUTY, by Silk Scarves Colorado. Select Your SIZE! Birthday Gift, Anniversary Gift, Christmas Gift. Bridesmaid Gift. Gift-Wrapped. Elegant Handmade Silk Scarf. Hand Dyed Silk. Handmade in Colorado, USA. 100% silk. 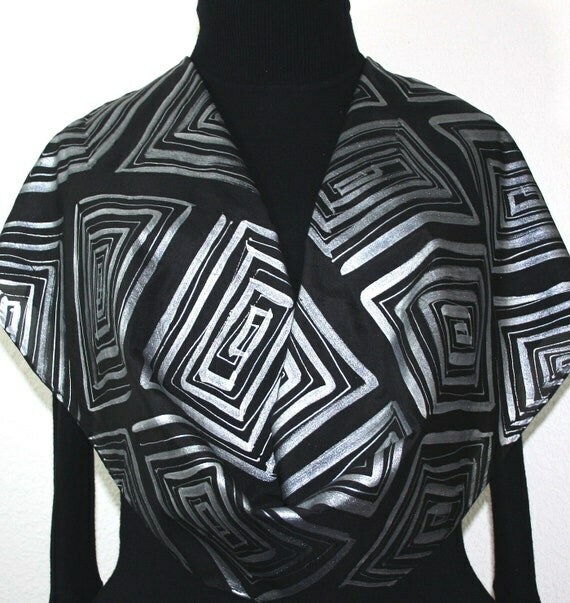 This is a 100% smooth silk scarf in black, featuring geometric shapes in silver (or in gold). This is an elegant scarf that would make a stylish accessory to a more formal outfit. 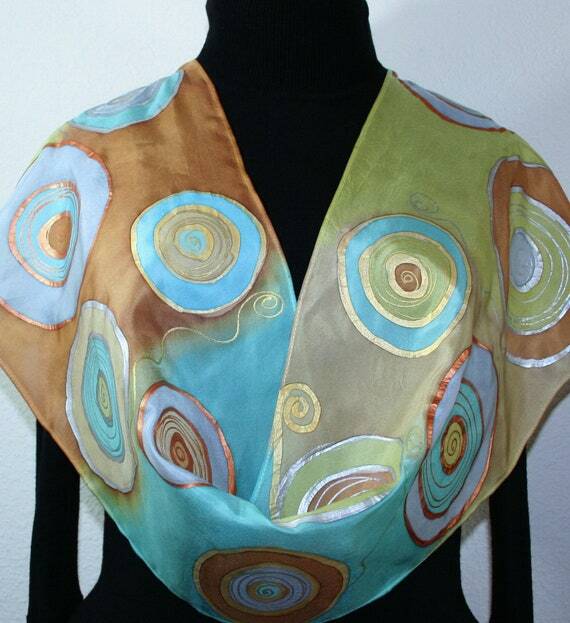 Hand Painted Silk Scarf Beige Olive Terracotta Handmade Silk Scarf CIRCLES OF LIFE, by Silk Scarves Colorado. Select Your SIZE! Birthday Gift, Anniversary Gift, Christmas Gift. Bridesmaid Gift. Gift-Wrapped. Elegant Handmade Silk Scarf. Hand Dyed Silk. Handmade in Colorado, USA. 100% silk. This is a 100% smooth China silk scarf featuring circle shapes in earth tones, with some silver gray for contrast. Outlines are done in silver, brass and copper. Orange Teal Black Scarf Hand Painted Chiffon Silk Shawl TROPICAL RAINFOREST, by Silk Scarves Colorado. Select Your SIZE! Birthday Gift, Anniversary Gift, Christmas Gift. Bridesmaid Gift. Gift-Wrapped. Elegant Handmade Silk Scarf. Hand Dyed Silk. Handmade in Colorado, USA. 100% silk. 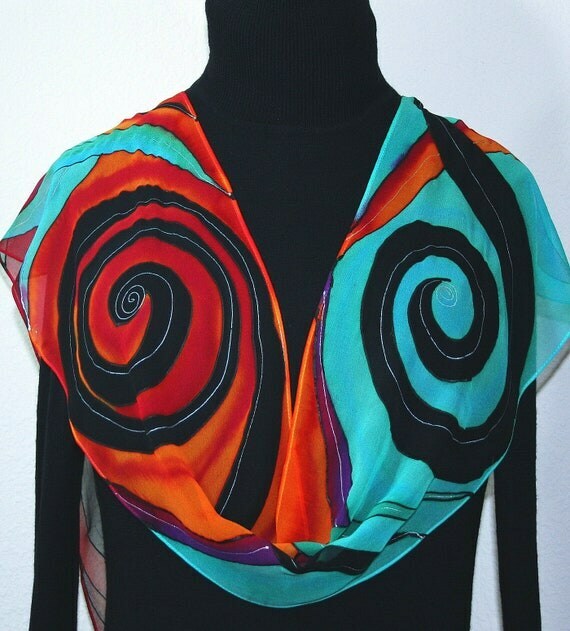 This is a 100% Chiffon silk scarf featuring swirly shapes in black, turquoise, orange and burgundy. This is a very feminine, light, transparent chiffon scarf. 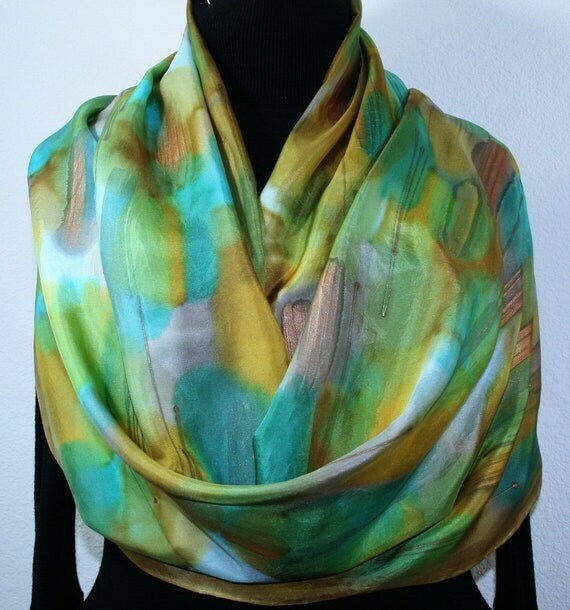 Silk Scarf Handpainted Green Beige Gold Handmade Silk Wrap GREEN SANDS, by Silk Scarves Colorado. Select Your SIZE! Birthday Gift, Anniversary Gift, Christmas Gift. Bridesmaid Gift. Gift-Wrapped. Elegant Handmade Silk Scarf. Hand Dyed Silk. Handmade in Colorado, USA. 100% silk. This is a 100% smooth China silk scarf, featuring artistic brushstrokes in shades of green, sand terracotta, tan, vanilla, taupe, gold brown; decorated with metallic brushstrokes in golden brown and tan gold. This one is a very artistic and chic design, great accessory to any type of outfit. Silk Scarf Handpainted. 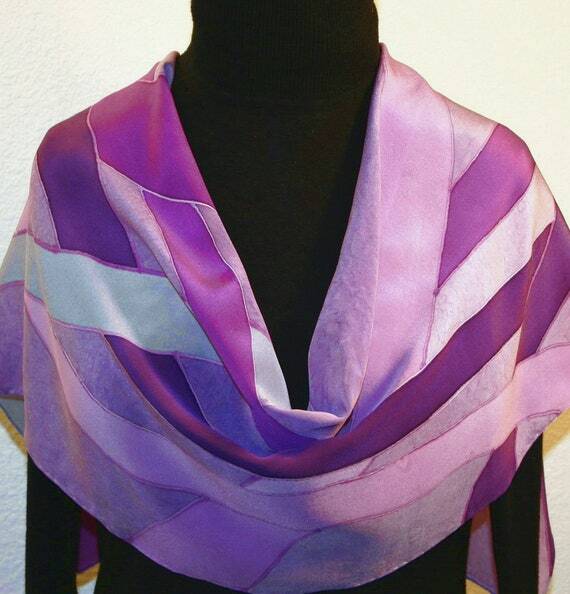 Lavender Pink Purple Handmade Silk Shawl PURPLE PATHS, by Silk Scarves Colorado. Select Your SIZE! Birthday Gift, Anniversary Gift, Christmas Gift. Bridesmaid Gift. Gift-Wrapped. Elegant Handmade Silk Scarf. Hand Dyed Silk. Handmade in Colorado, USA. 100% silk. This is a 100% Habotai silk (smooth China silk) scarf in lavender, featuring crossing sections in various shades of purple and dark pink, outlined in dark metallic purple. It is a chic and elegant scarf that makes a great accessory to any outfit. Lavender Gray Silk Scarf Handpainted Handmade Silk Wrap SILVER MEMORIES, by Silk Scarves Colorado. Select Your SIZE! Birthday Gift, Anniversary Gift, Christmas Gift. Bridesmaid Gift. Gift-Wrapped. Elegant Handmade Silk Scarf. Hand Dyed Silk. Handmade in Colorado, USA. 100% silk. This is a 100% Habotai silk (smooth China silk) scarf, featuring a variety of geometric shapes in very pale shades of lavender, violet, purple, turquoise and silver gray, outlined in silver. This is a longer scarf, allowing more generous wrapping - size: 14" x 70" (35 cm x 178 cm). 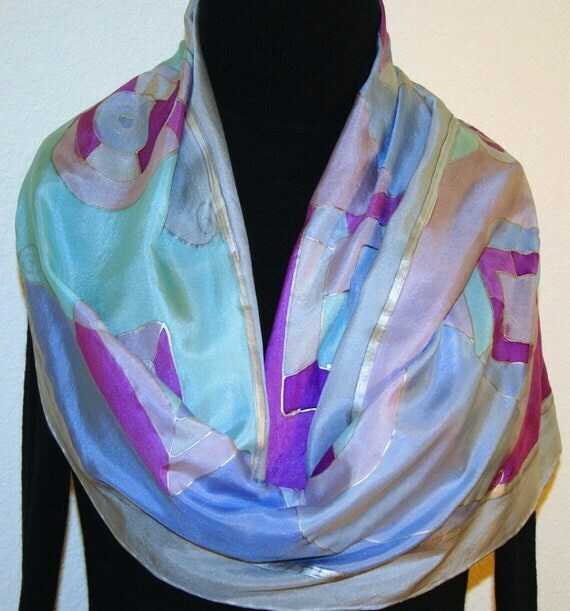 Blue Purple Silk Scarf Handpainted Handmade Silk Wrap TAMED WAVES, by Silk Scarves Colorado. Select Your SIZE! Birthday Gift, Anniversary Gift, Christmas Gift. Bridesmaid Gift. Gift-Wrapped. Elegant Handmade Silk Scarf. Hand Dyed Silk. Handmade in Colorado, USA. 100% silk. 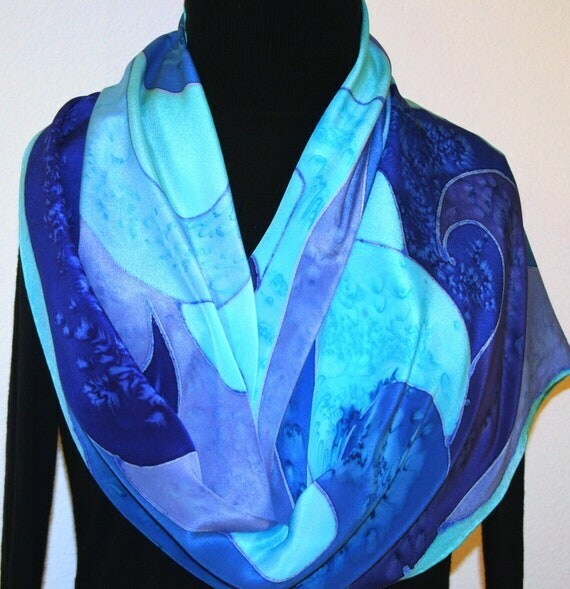 This is a 100% habotai silk (smooth China silk) scarf featuring waves in lighter and darker shades of blue and violet; on a light teal background. Silk Scarf Hand Painted Beige Brown Pink Handmade Silk Shawl ROSE BUSH, by Silk Scarves Colorado. Select Your SIZE! Birthday Gift, Anniversary Gift, Christmas Gift. Bridesmaid Gift. Gift-Wrapped. Elegant Handmade Silk Scarf. Hand Dyed Silk. Handmade in Colorado, USA. 100% silk. 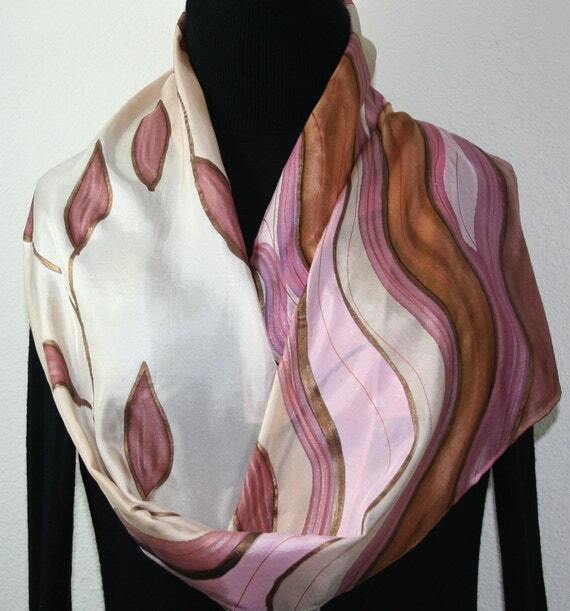 This is a beautiful 100% habotai silk scarf in soft shades of light beige, light browns and rosy pink. Decorated with metallic accents in ice pink, light brown and bronze. This chic silk scarf makes a great accessory to any outfit.